"He had an up-and-down year last year because of some injuries, but by the end he was definitely figuring it out. That's the thing -- two years ago, Jayson Megna was playing in the USHL -- one year in the USHL, one year in college hockey and then, bang, you're a pro. You don't just figure it out overnight. Most guys don't. And it's definitely a process. He... made big strides last year." "He's going to be a speed guy. I wouldn't put him as a big numbers guy but definitely an effective player. With his speed, he'll give people fits." Sounds like a pretty accurate description, eh? Due to his impressive start, he earned an immediate promotion to Malkin's line, and most importantly, hasn't looked out of place there. In the first game of the home-and-home with Columbus last week, Megna scored his second goal and earned the third star of the game. It is a very small sample size, but like Maatta earlier this season, how can the Penguins send Megna back to Wilkes-Barre once all of their forwards are healthy? The simple answer is that they can't, and this is a good problem for the Pens to have. The even better news is that I think we are just scratching the surface for what Megna can bring to the table. When Megna was at the University of Nebraska Omaha, he ranked third on the team with power play points, and second on the team in shorthanded goals. He also finished +13 for the year. I could easily see Megna's style of play and his speed having an immediate impact on a Penguin's penalty kill that currently ranks 17th in the league. We have all talked at length throughout the season that the Pens depth at forward would be a question mark with many of their departures. All of a sudden, it looks like this could be becoming an area of strength for the Penguins. They have been fortunate that players like Glass, Adams, and D'Agostini have looked very good so far. 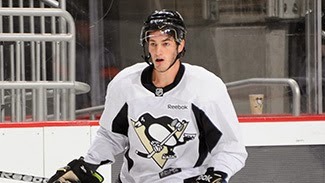 I believe Vitale and Engelland, who have also looked good, will be the odd men out once everyone is healthy. The fact is that Shero took a low-risk chance by signing Megna in 2012, and it looks like he and the Penguins have added to their good fortunes by hitting the Megna lottery.